Between the Sainte-Victoire mountain and the Luberon, a traditional provençal mas set in large grounds with swimming pool. 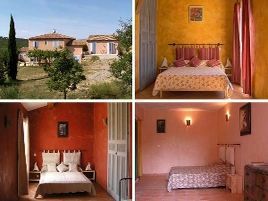 Spacious, comfortable rooms with warm ochre tones, decorated with Michel's own paintings and each with its own terrace. Hearty breakfasts with homemade jams served under the arbour in fine weather. Warm welcome from Geneviève and Michel, ready with great tips for visiting this lovely region..
- golf de Pont-Royal à 17 km. 3 rooms with shower and WC. From 58 to 70 euros (1 pers. ), 76 to 100 euros (2 pers. ), 100 to 120 euros (3 pers. ), 128 to 140 euros (4 pers.). Gîte also for rent. Baby equipment, babysitting, games. For teenagers: swimming pool, hiking and cycling paths. Family rooms. The closest station is Aix-en-Provence TGV, located at 35 km. The closest airport is Marseille Provence, to 40 km.